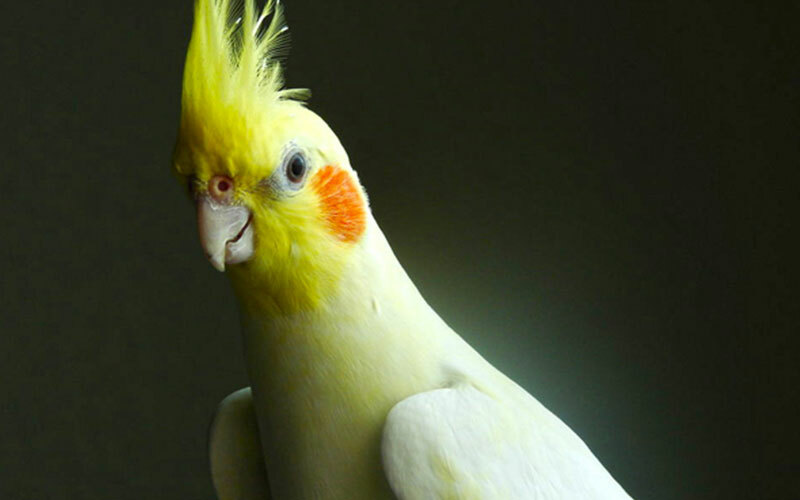 The cockatiel is also known as the Quarrion or the Weiro and is native to Australia. The bird’s distinctive crest on its head expresses its emotional state. The crest is dramatically vertical when the cockatiel is startled or excited, gently slanting in its relaxed state and flattened close to the head when it is angry or defensive. The crest is also held flat but protruding outward in the back when the cockatiel is trying to appear alluring or flirtatious. The cockatiel’s plumage is usually grey with prominent white flashes on the outer edges of each wing but may have horizontal yellow striped on the outer surface of their tail feathers and yellow spots on the outer surface of the primary flight feathers of their wings. The face of the male is either yellow or white, while females have a grey or light grey face.